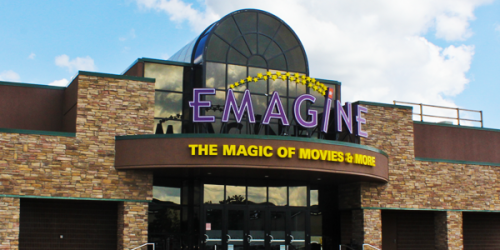 Emagine Rochester Hills Theatre is located behind Best Buy in the Hampton Village Centre at Rochester Road and Auburn, just North of M-59, just north of M-59 at 200 Barclay Circle, Rochester Hills, MI 48307. D-Box Seats – Move with your favorite action film in these large, comfy motion seats. Available exclusively for select films, the intensity levels are adjusted at the touch of a button. Huge Screens – No squinting at this screen. All 13 theatres have huge screens so you are immersed in each movie. Handcrafted Pizzas, Gourmet Popcorn & OlivEpop – Try one of our handcrafted pizzas made in our stone ovens. Our OlivEpop popcorn is made with 100% Olive Oil and dressed with sea salt for a healthier version of your favorite movie treat. We also offer Cheddar and Caramel Popcorn varieties. Birthday Parties – Host up to 50 people at your next birthday party and have an event that everyone loves!